It’s funny how we, Mauritians, have still not understood that Kreol Morisien is a full-fledged language. Take for example the Made In Moris campaign. What is “Made In Moris” supposed to mean? Why do people insist in mixing Kreol Morisien with English? Or French? I have no problem using either Kreol Morisien, English or French. “Ine fer Moris”, “Fabriqué à Maurice” or “Made in Mauritius” all sound ok.
For example, for the local market, “Ine fer Moris” would be great. But for export products to France, “Fabriqué à Maurice” is good too and, of course, “Made in Mauritius” for all other uses. The first one is way too complex and too, ahem, intellectual: a fingerprint in the shape of the island! It’s typically what non-designers come up with when they have to design a logo. The second one is too easy. Looks like a myriad of logos which are used everywhere in the world except that Mauritian colours are used. The third one is way too black and Facebooky. Don’t tell me that criticising is easy while actually doing one logo is hard. I know that. But, as you all know, no one is paying me to come up with a logo. In essence, don’t mix languages. Respect our Kreol Morisien. And, please, come up with a nice logo. Hi Vijay, bus stop in Kreol Morisien is bis stop I guess, the same as week-end in French being week-end. In general, we do not mix English/French and Kreol Morisien in the same phrase which is what Made In Moris does. Of course, there are exceptions (e.g. Ki position my friend) but they are not that pervasive. Else among the three ones I prefer the third logo, given that a thumbs up illustrates a good quality of product and the four fingers contain our National colors. hi i am sanjay,i cycle to work almost all day,when sunny,i wear a normal cycling bib short and jersey,i would like to invite you to print your logo on my existing outfit or you may as well choose to give me outfit with your intended logos to wear to help promote your project. Bonjour! Je rejoins ceux qui ne sont pas d’accord avec les logos; ce n’est ni du franglais ni autre chose. Pourquoi pas le drapeau mauricien ou le pavillon d’état ou civil. Le L’idée du dodo est bonne aussi car il a existé seulement à Maurice; encore faut-il qu’il soit bien dessiné car on en voit plusieurs versions sur le net et qui font parfois peur! L’île de la Réunion a exploité l’image du dodo et ils y réussissent mieux qu’ici…???!!! Come on! That’s what mauritians do, we mix up languages! We all understand “Made in Moris”, that’s the important thing. Je crois qu’il faut savoir saluer une bonne initiative quand on en voit une! Did we forget our own “Mauritius c’est un plaisir” which flopped so badly? Pathetically bad, isn’t it? Was it used a lot or did we “just” lose a few millions of rupees? It is baffling how much nonsense comes out of people through sheer ignorance. This is a private sector initiative, without any financing from the Government. And it is an advertising company that has come up with these logos. 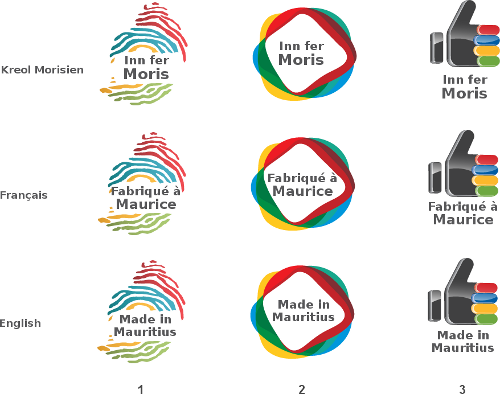 Give credit where it is due, this campaign is actually letting Mauritians choose the logo despite being financed by a group of companies. Thanks for informing us that this is a private sector initiative. I’m relieved as a taxpayer. This logo is not meant to be printed on exported products, but on products sold in Mauritius. The main goal is to let Mauritians know if they are buying Mauritian products or not, and to fight bias of people thinking that what is imported is always better than what has been done in Mauritius. “Made in Moris” is not strong enough then to convey the message that what we have in Mauritius is better than most of the things we import. “Quality product of Mauritius” (or something similar) and the equivalent in Kreol or French would have been better… IMHO. I agree that it should be in English/French when used in exported products. But if it is for the Mauritian market then I would have liked “Inn fer dan Moris sa”. Looks like the one with the fingerprint has been selected. Whether financed by the Government or privately owned is irrelevant here because it concerns every Mauritian. When you do something at the national level, then you have to bear the criticism and see it from the point of view of others. It seems the majority agrees the 3 logos ain’t good enough to represent the country and I share the same feeling. The logos look amateur and just by including the 4 colours of our flag does not make them any more worthy. C’est ce que mes enfants de 10 et de 8 ans me faisaient remarquer ce matin en passant devant un billboard. Heureusement que le ridicule ne tue pas. What about using French or Créole for teaching?